Got Tansy? 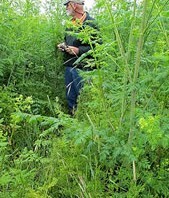 Watch the video below to learn how, and why it’s important to control Tansy Ragwort in San Juan County. One of the benefits of noxious weed control in San Juan County is the protection or enhancement of wildlife habitat. Here a Pacific Tree Frog rests on a flower. Photo credit: Shawn Beach. Weed Wrench Loans to San Juan County Residents. To provide education and outreach services to public and private entities on topics related to invasive plants. 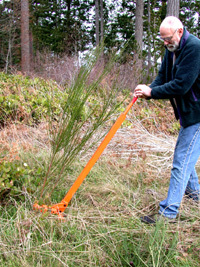 To provide education-based enforcement and implementation of state and county noxious weed laws. 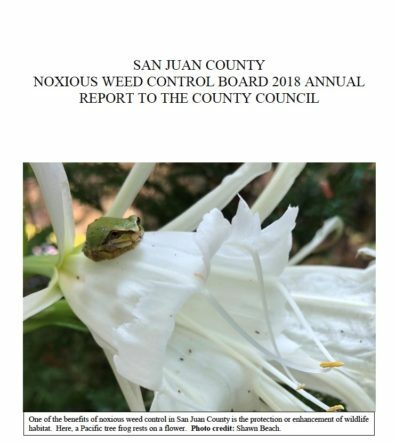 To work closely with individuals, property owners, businesses, associations and government agencies in noxious weed control efforts. 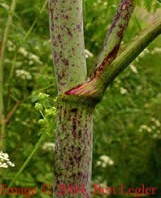 To eradicate all known Class A noxious weeds within the county. To Contain or control the spread of all state-designated or county-selected Class B and C noxious weeds within the county. 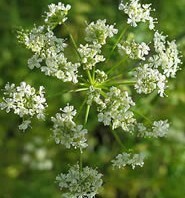 To prevent the incursion of newly listed or unlisted weeds of concern on to county lands. Brochures and other literature are available online or through the Weed Control Program at 376-3499. California’s Plant Right (a resource guide for selecting non-invasive plants for your home landscape).